Thornwood fishery is located in Epping, Essex and is made up of two trout fishing lakes and a pool all of which are fed from chalk streams, the trout lakes are crystal clear making them ideal for anglers to try a spot of stalking. Both fishing lakes are stocked on a weekly basis with both rainbow and brown trout to over 10lb. The fishery is open all year round and is available for coporate events and competitions. Toilets, free parking, tackle shop, farm shop, BBQ available for groups. Thornwood Springs run a small tackle shop that stocks rods, reels, lines, fishing kits and a large selection of Fulling Mill flies. Thornwood also hire out fishing equipment and tackle. 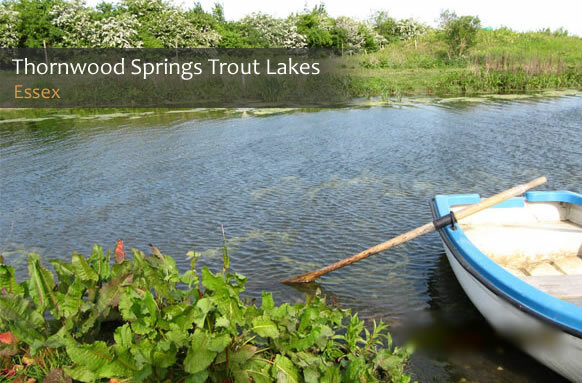 Thornwood also offer trout fishing tuition. Prices start from £15 for one fish, price varies depending on the lake you fish and the amount of fish you catch.